Although it’s a Windows game, I’ve never met anyone without a sweet spot for Minesweeper, the addictive little puzzle game that Microsoft debuted in Windows 3.1. Sadly, though, it never came to the Mac. But if you love a good game of Minesweeper, we’ve got some great news. You can now play it right within Notification Center. Better act on it soon, though: Apple has a tendency to pull interesting iOS 8 widgets like this one. 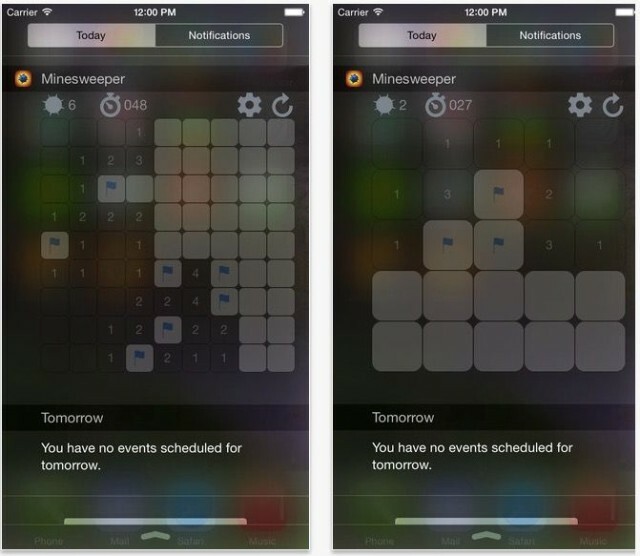 Created by developer AA Mather, Minesweeper – Widget Edition is a version of the classic puzzle game that you can play right from the Today tab of Notification Center. The game is played the same as it ever was: You flag certain tiles on the grid as being “mines” based upon the numbers of the tiles that surround them. The only difference is, you can play it within any app just by dragging your finger down on any screen. Minesweeper – Widget Edition costs just $0.99 on the iOS App Store, although if you want to buy it, I suggest you do so soon. In the past, Apple has had a disconcerting history of pulling the most interesting and interactive Notification Center widgets from the App Store. Minesweeper – Widget Edition could well be a contender. This entry was posted in Apps and tagged games, iOS 8, Minesweeper, notification center, widget. Bookmark the permalink.